THREE-BED HOMES near the new Luas Cross City stops saw their values increase by 15% over the last year, according to new research from Daft.ie. That’s compared to a 6% increase in similar homes near other rail stations. The 2017 DART & Luas stop-by-stop house price maps analysed the average asking prices for three-bed properties close to each of the 125 stops and stations in Dublin. For a larger image of the above map, click here. The figures are average asking prices controlling for time, size and type for each of the stations. The sample of properties for sale are from January to November of this year. It found that commuters living on the Dublin coastline pay on average the most for a property, with homes close to the Sandymount DART averaging €784,000. Properties near DART stations are among the most expensive with Lansdowne Road (€737k), Sydney Parade (€706k) and Dalkey (€699k) accounting for four of the top five most expensive stations to live by. On the Luas, homes close to Beechwood on the green line command the highest average asking prices (€727k), while those living in the city centre pay most on the Luas red line with properties near the Spencer Dock stop averaging €597,000. 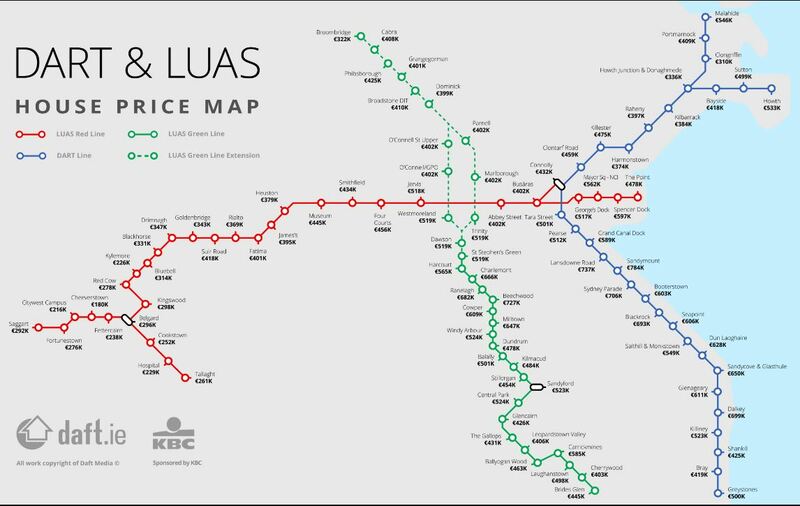 Daft.ie also analysed the average asking prices for each stop on the new Luas cross-city line, which opened on Saturday. Properties close to the new Dawson, Trinity and Westmoreland stops came out on top, with average asking prices of €519,000. Commenting on the figures, Ronan Lyons, economist at Trinity College Dublin said, “It is well known that transport infrastructure can have a big impact on property values. Over the last 20 years, Ireland has added lots of new infrastructure, including motorways and the DART. The opening of the cross-city Luas has clearly added value in the areas newly served by light rail: three-bed homes near the new Luas stations saw their values increase by 15% over the last year, compared to a 6% increase in similar homes near other rail stations. Email “Prices of homes near new Luas Cross City increased by 15% over the last year”. Feedback on “Prices of homes near new Luas Cross City increased by 15% over the last year”.